In order to ensure qualities, a variety of high-quality protein sources are needed. That’s why MASS EFFECT REVOLUTION was designed with Mass Effect OctaPure8 Protein Fusion for full spectrum protein balance. Quick-digesting hydrolyzed whey protein isolate, whey protein isolate, whey protein concentrate and SPI-90 help to immediately begin the post-workout repair of damaged muscle tissue,Micellar casein, milk protein isolate and calcium caseinate are digested more slowly, assuring a trickle-feed anabolic effect. 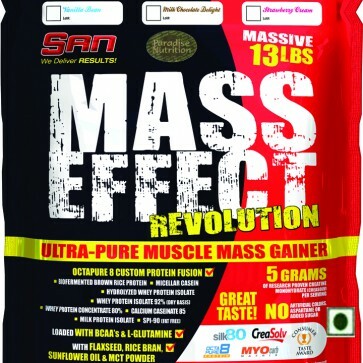 MASS EFFECT REVOLUTION Builds Solid Muscle Mass With The Purest Ingredients,Quick-digesting hydrolyzed whey protein isolate, whey protein isolate, whey protein concentrate and SPI-90 help to immediately begin the post-workout repair of damaged muscle tissue, giving MASS EFFECT REVOLUTION highly anti-catabolic properties. Add 4-8 heaping scoops (depending on caloric requirements) of MASS EFFECT REVOLUTION to a blender filled with 24-36 oz. (700-1000 ml) of cold water. Blend for a minimum of 45-60 seconds. If a cold shake is desired, please add a hand full of ice cubes and/or other calorie-contributing ingredients (Milk or Fruits) and blend for an additional 30-45 seconds. If a thicker, more creamier, calorie dense shake is preferred, add MASS EFFECT REVOLUTION in 24-36 fl. oz. (700-1000 ml) of nonfat or low fat milk instead of water. New users of MASS EFFECT REVOLUTION may find if beneficial to begin with 1/2 of a serving daily (4 scoops) for the first week and then gradually increase to 1 or more full servings several times a day. Consult your physician prior to use if you are pregnant, nursing or have a medical condition.